Questions concerning music and its inextricably intertwined and complex interface with time continue to fascinate musicians and scholars. For performers, the primary perception of music is arguably the way in which it unfolds in ‘real time’; while for composers a work appears ‘whole and entire’, with the presence of the score having the potential to compress, and even eliminate, the perception of time as ‘passing’. The paradoxical relationship between these two perspectives, and the subtle mediations at the interface between them with which both performers and composers engage, form the subject matter of this collection of studies. 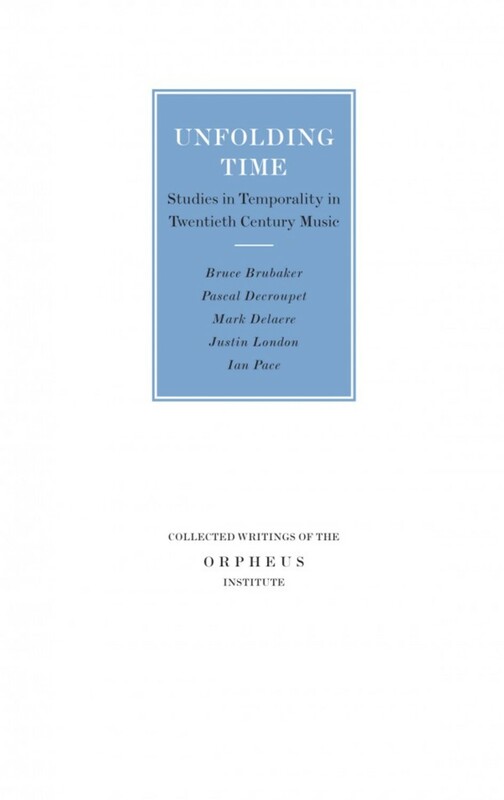 The various contributors address the temporal significance of specific topics such as notation, tempo, metre and rhythm within broader contexts of performance, composition, aesthetics and philosophy. The aim is to present novel ideas about music and time that provide particular insight into musical practice and the world of artistic research. With contributions by: Bruce Brubaker, Pascal Decroupet, Mark Delaere, Justin London, Ian Pace. Darla Crispin is a pianist and musicologist tracing perspectives from artistic research. Formerly an ORCiM Research Fellow, she is currently Associate Professor of Musicology at the Norwegian Academy of Music (NMH), Oslo. Mark Delaere is Professor and Head of Musicology at KU Leuven. His research covers mainly music from the 20th and 21st centuries, with a special focus on the interaction of analysis, history, theory and aesthetics of music.